Proper knife care is surprisingly simple. A well cared for knife is: sharp, clean, ready to use, and not broken. That’s really about it. A knife in this state will be fun and safe to use and will actually save you time! A small time investment to keep your knives properly maintained, will easily pay for itself in time savings during use, whether that entails mincing herbs, carving a roast, filleting fish, field dressing a moose or cutting up cardboard boxes. If your knives fail to meet one or more of the above criteria, you aren’t alone. In our experience, few people care for their knives well. If that’s you, don’t feel bad. We’ll help you do something about it! A few minutes of sharpening a month will keep most knives in good working order. A sharp knife lets you work quickly and safely because it cuts with minimal effort and does so when you expect it to. For example, when you go to cut into an onion with a sharp knife, it will bite in and cut instantly, instead of a dull knife which is liable to slide off the tough outer skin and maim one of your digits. A lot of people are intimidated by sharpening. Don’t be! Yes, sharpening is the most “complex” part of maintaining your knives but there is a tool out there for every ability level. If you are capable of using a knife, you can sharpen it too, provided you have the right tool. We have dedicated a whole page just to sharpening. We’ve also made several youtube videos on the subject which we link to on the sharpening page. One of the best ways to keep your knives in good shape is to use them properly. That means using them for their intended purpose and not letting the cutting edge come in contact with objects which are as hard or harder than the steel in the blade. The first point is self explanatory. Don’t abuse your knife. Knives are not meant to be pried with, hammered on or exposed to high heat. That is not an exhaustive list, but you get the idea. The second point is also fairly simple, but catches some people by surprise. A lot of common surfaces and objects are as hard or harder than a knife blade. Contact with these causes instant dulling, the more contact, the duller the edge will become. Here are some examples of things which are as hard or harder than knife blades: Granite countertops, glass (cutting boards for example), ceramics (think plates or baking dishes), metal utensils and tools, sand, rock, concrete, soil (small rock and sand particles are present in all soils), bone. The list goes on, but that covers a lot of common knife dulling culprits! Avoiding contact with these materials will greatly reduce the amount of sharpening you need to do. 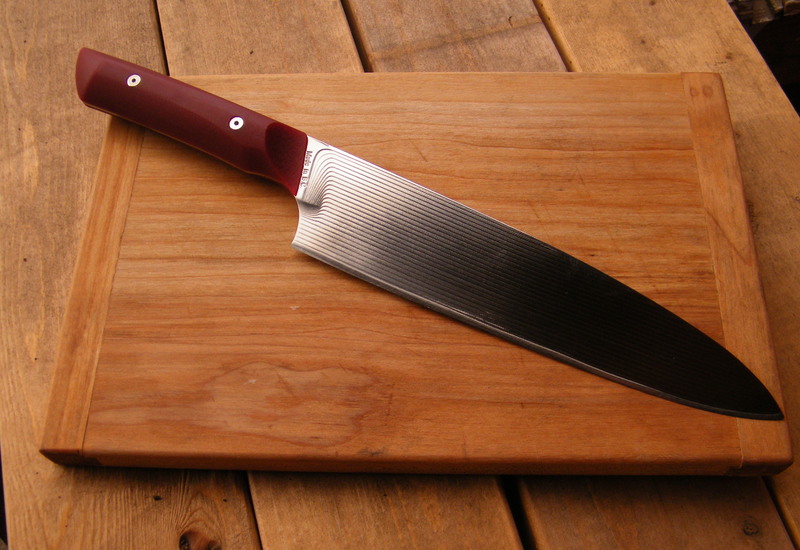 For kitchen knives, always use a plastic or wood cutting board. Outdoor knives are used in a less controlled environment, but with a bit of forethought, you can generally avoid unnecessary dulling. The best way to clean a kitchen knife is to wash it by hand with a cloth or sponge and warm soapy water and wipe it dry as soon as you are finished using it. There are a few benefits of doing it this way. Firstly, the knife will be ready for use again immediately; something you don’t get if you put it in a dishwasher. secondly, it won’t have a chance to bump into other utensils or dishes —and get DULL!— as it would in the dishwasher or sitting in the sink along with the dirty dishes. Finally, it won’t be lurking in the dish water to cut you when you least expect it! For fixed blade outdoor knives, we recommend the same “warm water and soap” method if you are at home. In the field, rinse with freshwater as needed. After exposure to salt water, rinse the sheath and knife thoroughly with warm water and soap if possible. Cold fresh water will do as well. If you want a really deep clean+disinfection of the knife and sheath, you may mix up a 10:1 water to bleach solution and let the knife and sheath soak for 10 minutes. Follow this with a thorough rinse in warm water. For folding knives, see this dedicated page. The knives shouldn’t be in a place where they could injure someone by accident. Loose in a drawer is a good example of the opposite of this. Knives should be kept dry. This prevents rust and bacteria growth. A wet sheath is a good example of a less than ideal spot to store a knife (sometimes unavoidable, but dry it out the first chance you get). 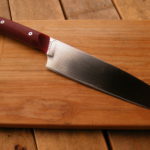 For kitchen knives we recommend one of the following: a knife block, knife organizer (insert with slots for in-drawer storage), knife roll (soft storage pouch with slots for each knife), or individual sheaths of some sort (magnetic ones are popular). Outdoor knives should be stored and carried in their sheaths, which should be kept free of grit and other potential knife dulling debris. If you can abide by these simple rules, you will always have sharp clean knives, ready for you when you need them. And that my friends, is a beautiful thing.